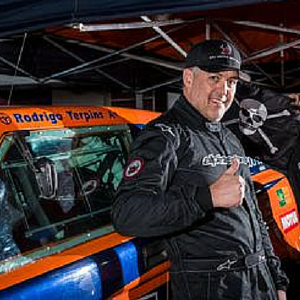 Rodrigo Terpins is, perhaps, best known for his successful Brazilian rally car career. Within Brazil and worldwide among rally enthusiasts, both Terpin and his prestigious Bull Sertoes rally team are widely known. Terpins (and his brother Michel) are members and riders of this coveted, highly honored team. The brothers compete in professional circuit racing and take part in the Sertoes Rally – which is known around the world as being one of the most difficult and technical rally tracks in existence. The race consists of a two-man team that, of course, tries to complete the course of varied terrain in the fastest time. Rally car racing is a complicated sport that requires concentration, skill, and incredible chemistry with your partner. Consistency and chemistry are vital to the team making it through the rough and varied terrain in the fastest time. At Rodrigo’s most recent Sertoes Rally saw he and his partner finish the first leg of the track in two hours – which is a great feat – and guaranteed the pair a finish in the top ten. This was a lot better than what had been initially expected of the pair. The pair maintained their cool and stayed on pace and ended up finished the prestigious Sertoes Rally in 8th place and 3rd in their prototype class. This was a huge achievement which gave Terpins even wider recognition for his skill. The Terpins family has a history in both sports and business. Jack Terpins, Rodrigo’s father, was a skilled and well known basketball player and later, a successful entrepreneur. Rodrigo has followed in his father’s footsteps both in terms of his aptitude for sports (which showed from a young age), as well as his skill in business. We recently sat down with Rodrigo Terpins to discuss his entrepreneurial venture, Floresvale, an environmentally-conscious timber company. Where do your business ideas come from? Inspiration can come from anywhere, and open communication is incredibly important to seeing ideas come to fruition. Once I have a decent idea formulated, I discuss it in detail with my colleagues and we determine how to get the most out of the least investment. How did you come up with the concept of Floresvale? I wanted a business that was based around the concepts of sustainability and environmental stewardship. In Brazil, clear cutting of forests is far too common and much of the wood removed from the country is done in an unsustainable fashion. Much of the wood that comes out of Brazil has no certification, which means there is no following of good environmental process and with no regard for waste and pollution. My business partners and I wanted to change this, so we looked for ways that we could supply the country and the world with certified wood that has been produced in sustainable ways. Are there any trends that you find exciting? I really like that there is an expanding environmental consciousness and awareness that didn’t exist to such a large degree a decade or more ago. The reason for the development of this type of consciousness is that more and more people see the destruction and devastation that goes into much of the manufacturing of raw materials. Coupled with growing concern about climate change, this has led to a greater concern, expanding the demand for products like what we produce. What is a habit that you think aids in your success? It is important to me that I stay connected with and aware of what is going on in the world outside of myself and Brazil. I strive to always continue to learn, so I still study hard and I stay abreast of what is going on where, especially as it relates to consumer trends. This makes me a better and more active decision maker, and allows me to make the best possible decisions for the company. How have you grown Floresvale? A lot of people who are in this business buy plots of land and then plant timber trees on said land. We avoided that step by buying plots of land that were already planted with forest, which allowed us to get online and grow with demand a lot easier than had we started completely from scratch.